Now that another printing of Gloomhaven has hit the shelves of gamers everywhere, we thought it might be a good idea to help you sort this behemoth. 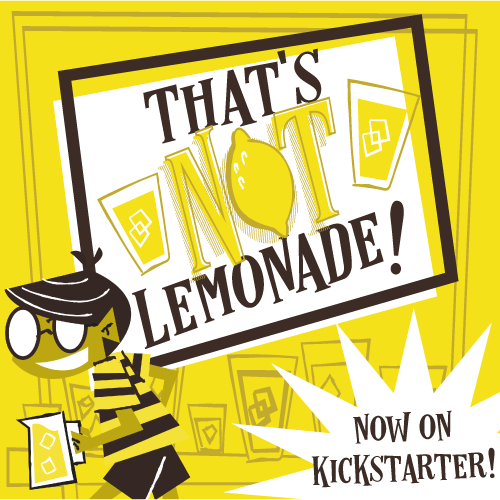 The folks at The Broken Token are one of many options, but they're the one I have. Have no fear: The pictures in this review only show Scenario 1, so no spoilers. So let's get to the review! You can skip the wood glue, but I'd suggest using it. 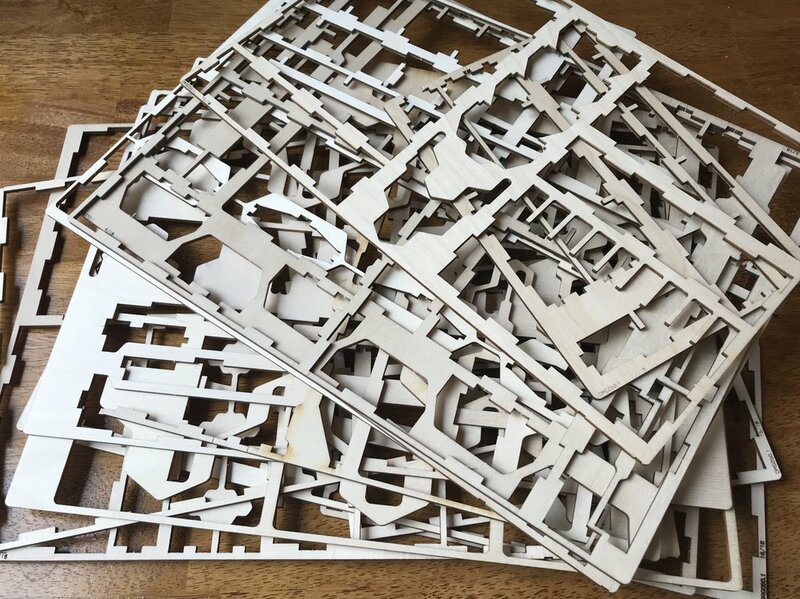 It's not that the organizer's not sturdy without it, but when you're talking about this kind of investment, you want as much stability as possible, and wood glue adds some without being cumbersome. Okay, so I'm not the handiest of people. And when it comes to a project like this, I'm VERY methodical. It took me around 5 hours to put this together. That's not including opening, organizing, and finding the various pieces. Now, that's with building a bit, putting some wood glue on joints, and letting it dry for hours (or overnight). Could you do it faster? Possibly. Probably. There are 17 removable trays, though you won't be removing all of them every time, or even most of the time. 1 large tray to hold all the map tiles. There's an order etched into the side to make it easier to put away. 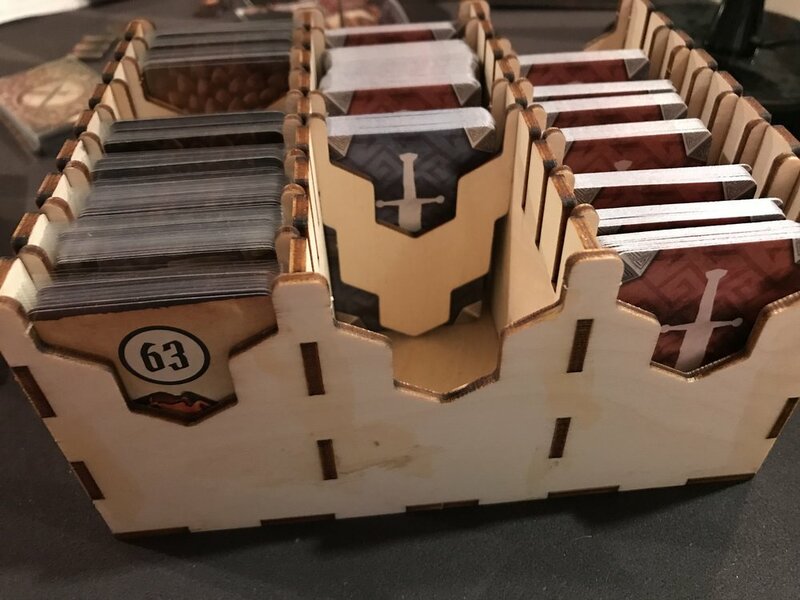 4 identical character trays that hold cards, tokens, the character miniature, the character board, and the hp/xp tracker. 1 tray that holds all of the boxes of miniatures. You'll leave this in the box most of the time. 2 trays that hold overlays, and 1 that holds trap overlays. 1 mini card tray that holds Item cards, Attack Modifier cards, Battle Goal cards, Random Scenario cards, etc. It also has dividers to split these up however you'd like. 1 regular card tray that holds Road and City Event cards, Personal Quest cards, etc. 3 "combat" trays that hold Damage tokens, Money tokens, Status tokens, and whole slew of other tokens that you'll need every game. 2 small tray that holds monster bases. 1 large tray that holds custom tuckboxes for each monster type in the game. First let's talk about some pros and cons. The map storage feels half-baked. The tray is etched with instructions for the order in which to place them all, but I'm still not a fan. It sticks out in an organizer where everything else seems very intentional. This is only a partial con: The organizer comes with 4 character trays that hold cards, the figure, tokens, and the health/experience tracker. Everything only fits back into the box if you have those trays full of pieces. But I'm only playing a 2-player game. So I have two character trays full of characters we're not even using, just so things fit. If I was playing a 4-player game, it would be a non-issue, and I'd be happy for 4 separate organizers, which is why it's only a partial con. It's pricey. I'm not saying it's overpriced, but there's no denying that an MSRP of $80 for an organizer is STEEP. That's just under 4/5 of what I paid for the whole game! The removable combat trays are terrific. Before we got the organizer we just had a pile of Status tokens on the table. These take up way less space, and you're not having to hunt through a pile looking for one particular token. I love the Monster tuckboxes. Each one holds the Monster tokens and Ability cards. It makes setting up and tearing down MUCH easier. Before, I had all the monster tokens stacked in piles on a small table in the basement It was ugly, a pain, and took up a lot of space. The boxes look great, too. I think this is the only organizer that uses tuckboxes, and it's one of my favorite things about it. It holds sleeved cards! So many companies don't think through this simple addition, but I'd be very upset if I had to unsleeve and sleeve cards every time I played. It looks great. All of the pieces are aesthetically pleasing. Some people have stained their organizers, but I like the light wood (plus I don't want my pieces smelling like stain). I marvel at the engineering that went into this organizer. Creating an organizer that fits everything and then fits in the box is a skill set I simply don't possess, but I'm glad someone did. There's even a "secret compartment" where you can slide in unopened envelopes and the Town Records book! One thing I've always admired about Broken Token inserts is that they don't just create a way to get it all in the box. They think of how people actually play the game, and what you might need as you're playing. That's why those combat trays are so great. You pull those out, plunk them down on the table, and you're ready to go! Ultimately, the question people ask is whether it's worth the money. I had the game for many months, and played a number of games, before I got this organizer, so I've seen both sides. Before I got it, I had pieces spread all over creation as I wondered how to organize them. I had a TON of baggies. I had piles of tokens taking up valuable space on the table. This organizer has sped up my games considerably. The game comes with ~100 scenarios. You won't be playing them all--at least on a first runthrough--but you'll be playing a bunch. Let's be very conservative and suggest that the organizer saves you 10 minutes on setup and 10 minutes on teardown. That's 20 minutes per scenario, times 70 or so scenarios you'll be playing. That's 24 HOURS of savings. An entire day! Gloomhaven is an investment--in time, money, and space. You don't need an organizer, but it's made things so much easier. It's shaved hours off my setup and teardown time, and I don't have pieces scattered all over the place. 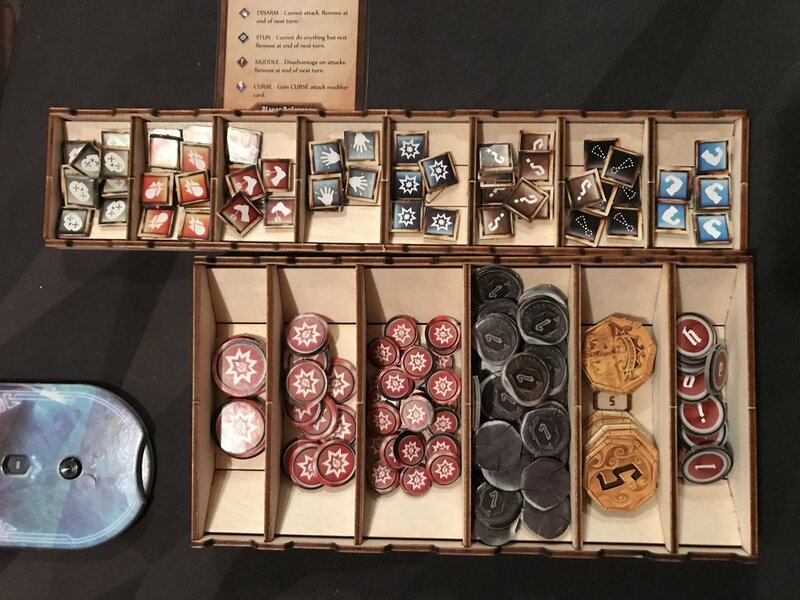 The Broken Token Gloomhaven organizer gets a big thumbs-up from me. It's exactly what I needed. 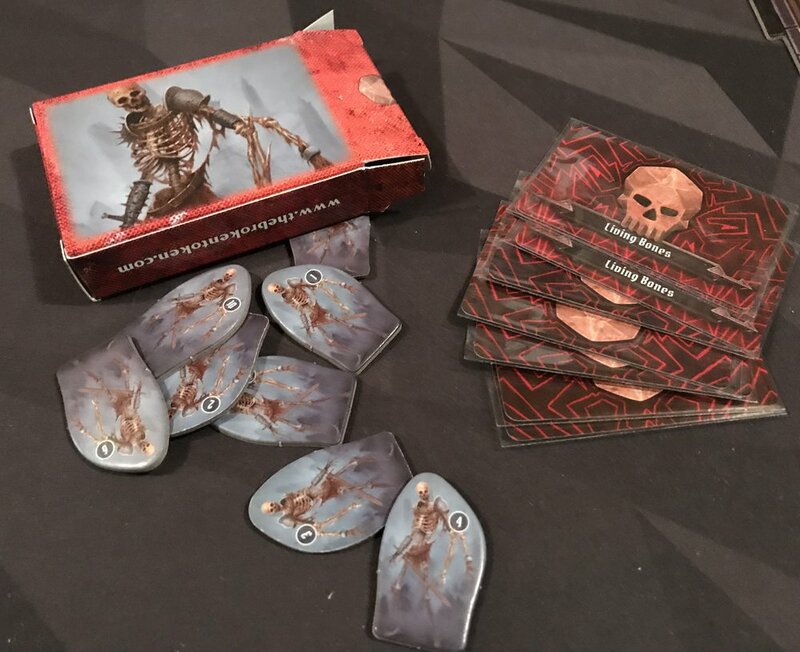 Theology of Games would like to thank The Broken Token for providing a review copy of their insert for Firestone's review. This in no way affected his opinion of the game.